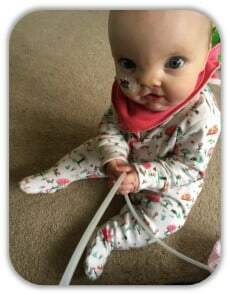 When we found out that Isla would be born with a cleft lip and possibly palate, one of the first things we were told was that she would not be able to breastfeed. Breastfeeding my eldest daughter, Isabelle, two years before had not been straightforward – she had a posterior tongue tie and lost 16% of her body weight by day four – so I was looking forward to a more positive breastfeeding experience with my second baby. It took me a very long time to come to terms with the idea of potentially not being able to breastfeed her directly, but once I did, I immediately started doing research. La Leche League was my first port of call. My local group Leaders were, and continue to be, an unbelievable source of support to me. We discussed various scenarios, including the possibility that if Isla ‘only’ had a cleft lip, breastfeeding may be an option. Depending on its severity, palate involvement would make it more difficult, if not impossible, given the lack of suction. At around 34 weeks, we discovered during a 3D scan that Isla’s palate was most definitely involved. I began to look into exclusively expressing. I was told by a healthcare professional that although it was a possibility, it was u nlikely that I would be able to completely fulfil Isla’s milk needs and that she would require formula top ups. That has stuck with me to this day and, now that Isla is one, I can say that was definitely not the case for us. My whole pregnancy felt completely out of my control and expressing was the one thing I could do. I spent weeks researching different types of breast pumps, considering motor life, speed settings and added extras (the one I chose has a fancy light, which is handy for not waking everyone up during the night and for toddler entertainment). I also bought a hands free pumping bra, and a lovely friend sent me her nursing cover. That was not something I would have used had I breastfed directly, but it made me feel more confident pumping out and about. I was ready to go! We had an appointment with our specialist cleft nurse at 34 weeks to create a feeding plan. 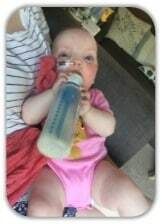 My local LLL Leader had provided me with excellent evidence-based information and the nurse noted that Isla was only to have colostrum/breastmilk, not be separated from me unless there were other complications, and that no one was to use any specialist bottles until she had been assessed for safe feeding by a specialist cleft nurse. After that meeting, I contacted the Infant Feeding Coordinator at my local hospital to discuss antenatal expression and I began collecting colostrum in syringes at 34 w eeks. By 37 weeks, I had collected and frozen 200ml, a real achievement! When Isla was about to arrive, my husband was sent rushing home to collect it whilst they prepped me for an emergency caesarean. After she was born and during the following few weeks, I tried to breastfeed her directly, but her cleft was so wide that she had no suction. Even bottle feeding was a challenge. I continued to express two-hourly throughout her NICU stay to mimic her feeds and managed to collect a lot of extra milk. I continued to pump ten times a day and I was producing three times the amount of milk Isla needed. Any attempt to drop a pumping session caused mastitis, which luckily I was able to overcome thanks to my local LLL Leader. I was beginning to run out of freezer space and I decided to donate some of my milk to help other babies. Our journey has been hard. Expressing felt like twice the work and we battled through a variety of challenges, starting with my emergency C-section and initial separation from Isla to her stay in the NICU, recurrent mastitis, multiple food allergies, surgeries, hospital stays, bottle feeding aversion and two periods of nasogastric tube feeding. There were many, many times I swore that pumping session would be my last, but I carried on every single time and it has totally been worth it. I have pumped everywhere: in the car, on planes, in cafes, whilst working at a sling library, at soft play centres, theme parks, whilst carrying Isla on my back in a woven wrap and of course, our endless hospital appointments. 1) A good double electric pump is essential. My hands free pumping bra also helped me a lot, as it allowed me to carry on looking after or playing with the girls whilst expressing. Reusable storage bottles also saved me a lot of money. 2) Accept help! I’m very independent, but I have learnt that accepting help doesn’t mean I’m not capable or competent. Even little things like someone cuddling the baby while you pump can be hugely helpful. 3) Don’t stop on a difficult day. I’ve had many challenging days where I felt like giving up. I was fed up of not having enough hands to pump and sort both girls, or having such a restricted diet. But I took things one pumping session at a time and I’m still going! 4) Join a support group for exclusive expressing, so that you can ask questions and get support on those challenging days. 5) Set small goals. When I was pregnant, I always aimed to pump until palate repair, but I realised that was quite a challenging goal so I set myself mini goals of two weeks, six weeks, lip repair, six months, palate repair. Each time I hit a goal it felt like a huge achievement and I gained more motivation to keep going. Now we’ve hit one year, I’m wondering what my next goal should be?